Be the first to share your favorite memory, photo or story of Alfonso. This memorial page is dedicated for family, friends and future generations to celebrate the life of their loved one. 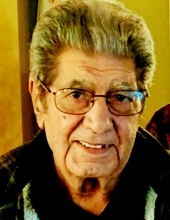 NEW BEDFORD-Alfonso de Arruda, 88, of New Bedford, died Sunday, March 24, 2019 at home surrounded by his loving family following a brief illness. He was the husband of Berta M. (Faria) Arruda with whom he shared 60 years of marriage. Born in Santa Barbara, St. Michael, Azores, he was the son of the late Antonio Francisco Arruda and Maria Oliveira Soares. Mr. de Arruda came to this country in 1960 and was a communicant of Our Lady Of Mount Carmel Church. He was employed as a foreman at J.F. White Construction until his retirement. He was a long time member of the Centro-Luso Club and enjoyed gardening and trying his luck at scratch tickets. His family includes his wife; 1 son, Carlos Arruda of Georgia; 3 daughters, Helena Aguiar of New Bedford, Elizabeth Alves and her companion, Ronald Nye of Wareham and Celina de Arruda of New Bedford; 10 grandchildren, Enjoli, Alexander, Christopher, Jonathan, Cody, Tanya, Amanda, Alfonso, Shawn and Abby; 5 great-grandchildren, Dominic, Maya, Zoraia, Landon and Joshua and several nieces and nephews. He was the brother of the late Antonio Oliveira Arruda, Erondina do Espirito Santo Arruda and Cristina Arruda. Visiting hours in the funeral home Tuesday 5:00-8:00 P.M. His funeral will be conducted Wednesday, 8:00 A.M. in the funeral home with a Mass of Christian burial to be celebrated in Our Lady Of Mount Carmel Church at 9:00 A.M. Interment in Rural Cemetery. In lieu of flowers, donations may be made in his memory to The Nemasket Group, Inc., 109 Fairhaven Road, Mattapoisett, MA 02739. To send flowers or a remembrance gift to the family of Alfonso de Arruda, please visit our Tribute Store. "Email Address" would like to share the life celebration of Alfonso de Arruda. Click on the "link" to go to share a favorite memory or leave a condolence message for the family.